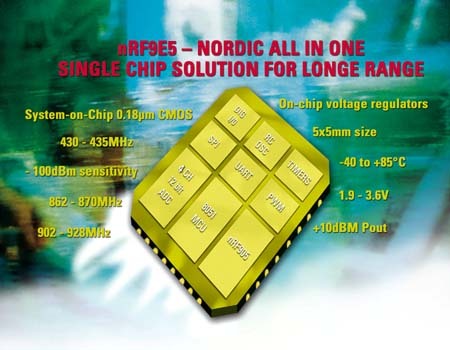 Oslo, Norway -- Providing global wireless equipment vendors with 430-950MHz transceiver technology with unsurpassed solution cost, performance, and ease of use, Nordic Semiconductor ASA today introduced the nRF9E5 transceiver with MCU and ADC, as well as the nRF905 transceiver. The nRF9X5 components are designed for wireless transceiver applications in industrial as well as domestic environments. Typical usage includes security systems, wireless data transfer, automatic meter reading, car alarm systems, point-of-sale systems, sensors, and various telemetry systems. Both the nRF9E5 and nRF905 are manufactured in an ultra modern 0.18um CMOS process. The entire transceiver including all inductors and filters is integrated in a single chip that gives the lowest cost solution to the end user. The nRF9E5 transceiver has an embedded 8051 compatible MCU, and 4 input 10 bit ADC -- for the first time providing the market with a complete low cost wireless system-on-a-chip solution with a single 1.9V-3.6V supply. Voltage regulators are embedded on-chip to further lower the system cost, and to enhance performance. Both components include the unique ShockBurst™ feature used in both receive and transmit mode which greatly simplifies software and protocol design as well as lowering system cost. ShockBurst includes features for CRC computation in both TX and RX mode, and address decoding in RX mode, greatly reducing the load and cost of the MCU running the RF protocol, compared to existing transceivers in the market. Furthermore, ShockBurst is capable of buffering up to 32 Bytes of payload coupled with short start-up times, which enables very low power duty cycled systems. A crystal and a resistor are the two main components needed externally to make up a complete system around the nRF905. The nRF9E5 requires an external EEPROM for external program storage. Both the components are delivered in a "Green" lead-free 32 pin 5x5mm QFN package. "The embedded features of the nRF9E5 enables complete wireless systems to fit into a single chip measuring 5x5mm. When the same solution also has an unbeatable system cost and outstanding performance figures, we know it will offer customers the best value for money today. The nRF9E5 is the smallest, it uses extremely little current, and can operate directly from most known battery technologies" says Geir Langeland, product manager for Nordic VLSI's standard products. Design and layout files are available for both the nRF905 and nRF9E5 from Nordic VLSI to facilitate low risk development and short time to market for customers. SPI, UART, Timers, RC-OSC etc. Complete evaluation kits with PC software and USB connection are available for the nRF905 and nRF9E5. The nRF9E5 is in addition supported by 3rd party SW development tools. Both the nRF905 and nRF9E5 are fully available from Nordic VLSI and authorized distributors. Suggested resale price in quantities of 10,000 units is USD 2.56 for the nRF905 and USD 2.86 for the nRF9E5.